Red Jasper Rough for Rock Tumbling - Polishes Great! This image shows a 5-pound bag of red jasper tumbling rough, dumped into a colander and sprayed with water to reveal its full color. Click on the image for a larger view. Wow! What a bright red color! This red jasper from South Africa is one of our long-time favorite tumbling roughs. Why? Here are four reasons: 1) it accepts an awesome polish; 2) it has a spectacular red color; 3) it shapes nicely; and, 4) it is tough enough that bruising rarely occurs in the tumbler. That makes this rough easy and enjoyable to tumble. We recommend it as a great tumbling rough for beginners. Because the pieces are mostly 1 to 2 inches in size, it is also a good rough to use when learning about ceramic media. This jasper is bright red in color and is nicely marked with a few veins and pockets of white to gray translucent quartz. It produces beautiful tumbled stones with a few interesting quartz veins. Rare pieces contain a tiny streak or a few specks of gray to silver hematite. The hematite suggests that this material was deposited in association with a banded iron formation. The rough in the photo above was photographed wet to show its full color. This red jasper is sold in five pound bags. You might find a few pieces as small as 1/2 inch in size, but most of the weight will be in pieces between 1 inch and 2 inches across. These will produce nice chunky tumbled stones. 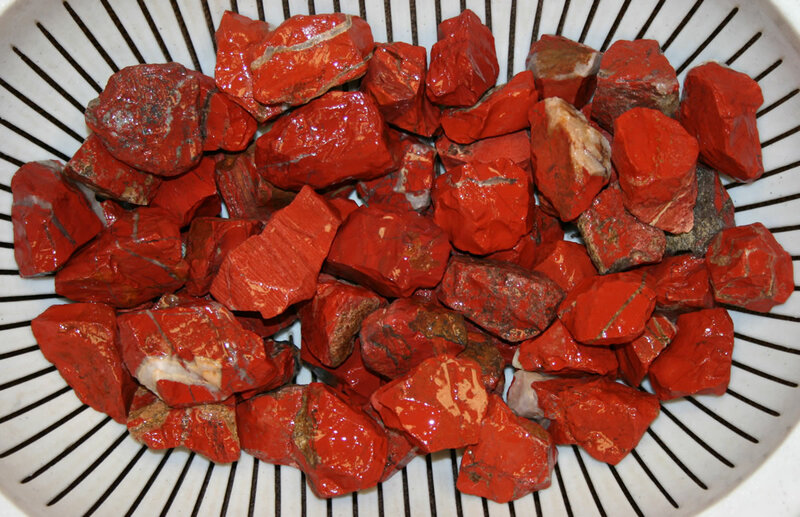 Shown here are some of the red jasper that we polished using the recipe below. 1) More Time: Although this Red Jasper is a little softer than most agates and shapes nicely, it is in large pieces that will require more time in coarse grit than beginner's tumbling roughs. In six, twelve and fifteen pound capacity barrels two weeks might be enough to shape the rough to your satisfaction. However, in small tumblers of two or three pounds capacity, three or four weeks might be needed. We suggest doing a clean-up at the end of two weeks, then decide if your Red Jasper needs more time in coarse grit to attain a nice shape and surface or if it is ready to begin the medium grit step. If you don't want to tumble this red jasper yourself, we usually have medium size (5/8" to 1") tumbled stones of this material for sale by the pound. You can find them here.